Installing Maypole Alley on Thursday May 9, 2013. We arrived far too late after many rain and technical delays on Wednesday to begin installation. Norma Markley, another New York based artist traveled with us and spent the rest of Wednesday the 8th of May with us. The three of us were able to check out our sites, and get the lay of the land. We were up early on Thursday and spent about 10 hours finishing and suspending the lines of banner, crest and pennants. Laura spent the day on the ladder hammering wood shims, followed by masonry nails into the brick mortar into which we could attach the lines. 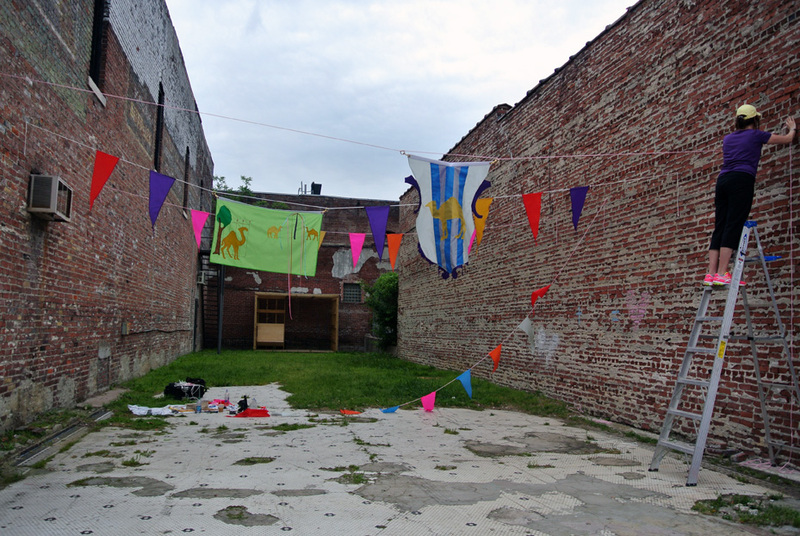 I spent the day hand sewing pennants onto the rope lines and getting them ready for Laura to install.